An oversized set of 6 lenses and prisms designed for mounting on a magnetic chalk or marker board. 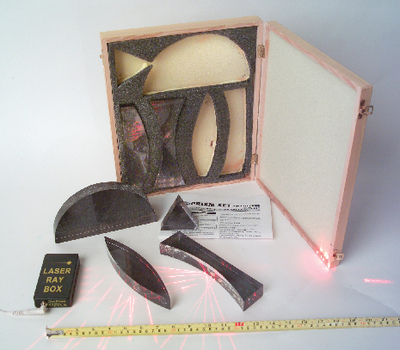 Lenses are about 8" long, so your optics experiments would be clearly visible from every part of the classroom. Each piece in the set has a pre-attached magnetic backing. An activity guide is also included. Set comes in a sturdy wooden storage case. Please note: Laser Ray Box not included. Ordering information: Contents include Semi-circular lens; Equilateral prism, 75mm sides; Double convex lens; Double concave lens; Single convex lens; and Single concave lens.